Coastal First Aid is a local First Aid training business based on the Mid North Coast of NSW. 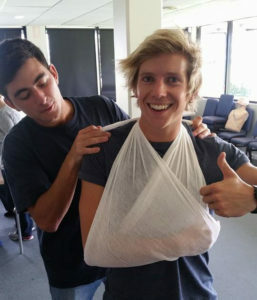 We deliver regular public First Aid courses in Port Macquarie and Taree. We also deliver First Aid courses to businesses, schools and other groups throughout the Hastings and Manning/Great Lakes area. Our First Aid courses are both nationally recognised and WorkCover approved. Coastal First Aid is a Training Partner of Healthcorp Pty Limited, a Registered Training Organisation (RTO ID: 91222). All our instructors are highly qualified and experienced. They have extensive experience in adult education teaching First Aid on top of extensive professional emergency response experience. Let them share their knowledge, enthusiasm and passion for First Aid, with you.